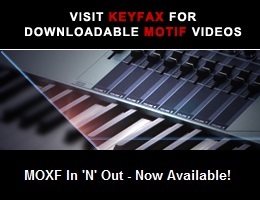 Viewing topic "From Motif XF to MoDX"
I have some 80’s libraries I bought here on Key fax when I had the Motif XS, then I later upload them to the XF and work perfectly. My question is if there is a way these 80’s libraries can be uploaded to the MoDX ? Although Motifator has apparently decided to not support the MODX (and I understand their position), since you purchased the libraries here and your question is related in part to Motifs, I’ll reply. An X0A (or X3A) file can be loaded to the MODX. The MODX has no “Voice Mode” - Voices from the XS or XF will be converted in the MODX to Performances having a single Part. XS/XF Performances can also be loaded to the MODX. Motif Songs/Patterns and Masters cannot. Does that mean the MODX does not have a “song mode”? I love what I’ve been reading about the MODX synth as a portable version of my beastie of a Motif XF8, but I would need the equivalent of song mode given how many layers, splits, and multiple sounds I use on a per-song basis. The MODX has a significantly different architecture than the Motif family. The modes you’re used to aren’t found in the MODX. It basically has, full time, what we’d call “Performance Mode”, but with 16 Parts instead of 4. Each Part is on a separate MIDI channel. Up to 8 of the 16 Parts can be simultaneously under keyboard control. Any of the 16 Parts can be individually selected for keyboard play. If you would use the MODX by itself, you could probably set up Performances to suit your playing needs. However, since the MODX doesn’t allow MIDI Receive Channel assignment per Part (it’s fixed), using an external controller won’t allow access to the things you described. You might want to download manuals from Yamaha to get a more detailed idea of the MODX operation. By the way, the above also applies to the Montage. I love the MoDX from what I hear and see of it. I’ll probably get one if for no other reason than it is light, yet powerful. I kind of wished that they would have retained the Master Mode. It was very useful in live situations. The MoDX seems to be to good to pass up, especially at the price. So, for clarity, it does not seem as though there is an easy way to take “song mode files” from my MotifXF8 (which is how I organize my sounds for live performance) and “import” them into the MODX/Montage as “performances”. Am I correct on this limitation in backward compatibility? Motif XF/MOXF Song/Pattern Mixings (which is what I presume you’re referring to as “song mode files") indeed can’t be directly imported, and would require that you rebuild them in the MODX. You might want to contact Yamaha Support to verify that, in particular to determine if an OS update could have addressed that. I’m thinking the same. I’m actually thinking of selling my Roland FA-08 and replacing it with the MODX8 or the Montage 8. Any reason you’d go for the MODX8 instead of the Montage 8? Price and weight obviously but any other reasons? I sold my Roland FA-06 to get the MODX7 and there is no comparison, in my opinion, about sound quality. I did like the Roland sampling architecture and SD card. The key feel was a little springier (though I never resonated with those slightly smaller keys). I don’t think you’d miss the FA-08, but your mileage may vary. There are no reasons except price and weight. Perhaps one prefers the lower cost keybed feel? MODX has fewer features and ability (Examples: 1.0 Gb Flash vs 1.75 Gb, 4 sliders vs 8, removed patch select panel buttons array, no secondary aux audio out ... etc.) vs Montage but it is half the price and half the weight. The basic internal engine is identical. Some say the DACs (that turn digits into analog audio out) are better in Montage, i don’t know. There is nothing intended to be “better” in MODX than Montage other than price and weight. Yamaha de-featured it a bit so there still a reason for some to buy Montage. OK - here’s the only other MODX advantage: key-for-key (e.g. 6 vs 6, 7 vs 7) the MODX is shorter than Montage as they moved PB and MW controllers from left of keys to above the keys. Combined with reduced weight, this has alot of value if you travel with a board alot. but some may hate the new location for usability. Brahaha, ok I am a stage guy and hate all things studio(technicians never applaud except when paid :) ). I currently play a Nord and a Roland and just bought the new MODX and see y’all hating on it! My decision was based on the fact that the Roland made noises, the Yamaha makes sounds! So, never owned a Motif(although I have played a couple back in the day), did not look at them, my keyboards have to be simple and maneuverable on stage(not complicated) and this is what I picked. My question is this, I am quickly trying to get up and running and am looking for the Yamaha patch to Turn Me Loose(Loverboy), Rocky Mountain Way(Joe Walsh my guitarist covers the talk box), and 1999 (Prince). I have found most everything else. Thanks guys and I have found that everyone find the board or guitar which feels good to them. I still own and play my Alesis QS8! My favorite and I have my original Fender suitcase along with the Bassman Amp and ToneRing cab for MORE SOUND! LOL! Also, Nords are great sounds but limited on space to upload. You have to give away a child to get a new one! I am interested in interesting music patches that you guys recommend. Anything with 80’s patches like the Who used(which come standard on Korg for some reason?) Thanks guys!